Where Does the Glock E-Trainer Fit In Your Dryfire Training Strategy? A few months ago our company released a new product to the market called the Glock Easy Trainer or Glock E-Trainer for short. The reception in the market has been greater than we anticipated but there are still some questions we've received repeatedly that we felt needed to be addressed. First, What is the Glock E-Trainer? The Glock E-Trainer is a simple device that is installed onto any standard Glock handgun that, when installed, prevents the trigger from breaking and thus keeps the firing pin from being released. This ultimately means the trigger can be operated repeatedly without having to reset the trigger by racking the slide. Traditionally on a striker-fired handgun, in order to dryfire the gun you would need to rack the slide after each trigger squeeze. Thus the Glock E-Trainer eliminates that action making dryfire training more effective by allowing more trigger presses in the time allotted and by removing the need to rack the slide after each trigger squeeze. What is the Purpose of Dryfire Training? More Total Time on the Trigger: We train dry (without ammo) because if we only get firearm practice when we have the time to go to the range and the money to pay for ammunition then none of us are likely to get enough time on the gun to build strong shooting skills. Thus we rely on dry fire training to augment our live fire in order to build deeper skills. Training Things You May Not Be Able to Do Live: We train dry because many of us don't have access to live fire ranges where we can practice critical skills such as target transitions, moving while shooting, 360 degree environments, use of cover, low-light, weapon transitions, and much much more. Thus we rely on dry fire to train these skills and activities that we otherwise would never be able to practice. Overcoming Shooting Problems Caused by Live Fire: We train dry because there are some shooting issues that are created by constant live fire. Dealing with recoil anticipation for example is much easier to practice dry where there is no recoil. Since the entire purpose of dry fire is to practice the feeling of breaking and resetting the trigger this product is completely useless. If you dry fire any striker-fired gun including a Glock, then you have to rack the slide between each trigger press. Can anyone truly suggest or believe that to remove the feeling of the trigger break eliminates any benefit of the practice session while also believing that racking the slide between each trigger press is perfectly fine and has no potential negative impact? To believe that is to believe that muscle memory matters only in the trigger finger and not in the body as a whole. If you need to defend yourself you aren't going to press the trigger and then rack the slide unless it's to clear a malfunction. 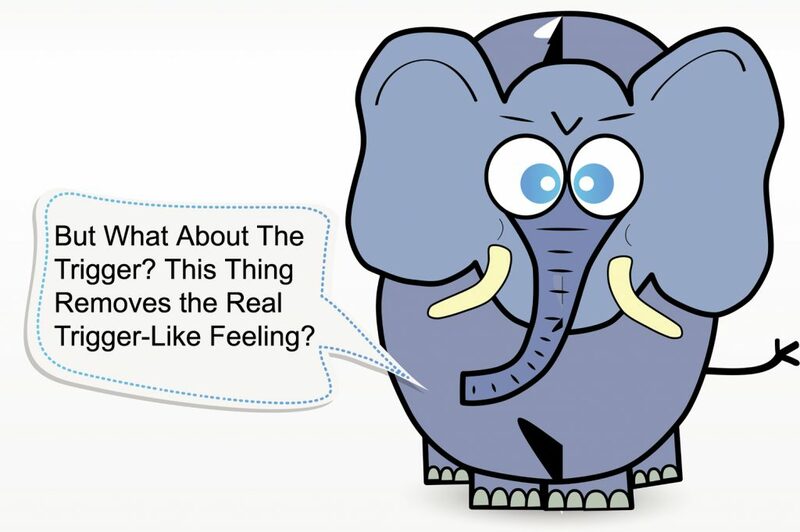 To suggest otherwise is a contradiction. So Where Does the Glock Easy Trainer Fit? You would want both because any quality dryfire training strategy is going to incorporate a lot of different skills and situations. Each of those may be better practiced using different tools. The SIRT may allow for repeated trigger presses without racking the slide but when it comes time to practice malfunction clearing or reloads you may want to have a real firearm with a slide that can be racked for example. In some of my dryfire training I will focus on operating the trigger and then manually racking the slide. In other drills I may attach the Glock E-Trainer and work on steady trigger manipulation without disturbing my sight picture. Other times in dryfire I may use laser inserts or a bore sight. Sometimes I use household objects as targets and other times I will use LaserLyte targets or the LASR software. A quality dryfire practice session may incorporate several tools and methods in order to be well rounded, just the same as a live fire training program is going to incorporate a variety of tools and methods. Don't get stuck only doing one thing over and over in your training sessions! What do you think? 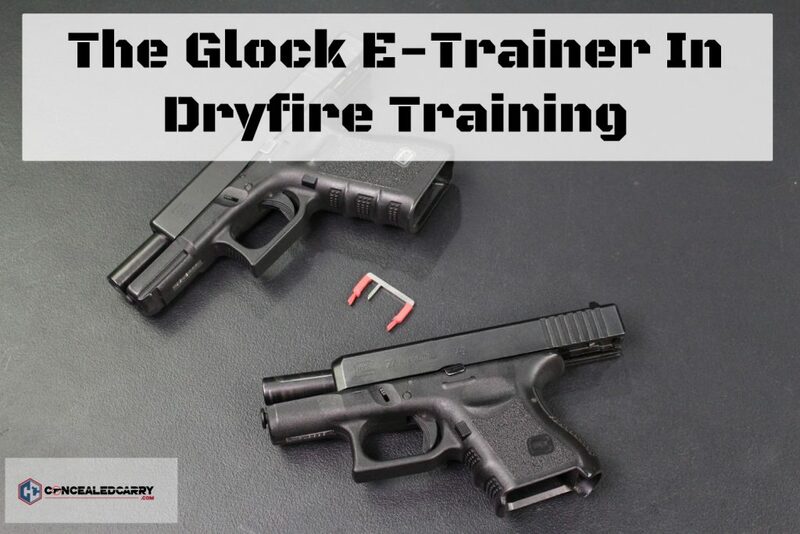 Have you considered the Glock E-Trainer for your dryfire practice? If not please consider placing your order here. Like everything we sell the Glock E-Trainer comes with a 60 day no questions asked return policy. 4 Responses to Where Does the Glock E-Trainer Fit In Your Dryfire Training Strategy? So does this product allow laser training and multiple shots with training cartridge? No. It blocks the firing pin from being released which means it won’t strike the laser cartridge. This is another one of those things where you can’t have the best of both worlds. If you use a laser insert then you will have to just rack the slide after each shot in order to reset the firing pin. I was always told not to dryfire because it could damage something. I just bought a Springfield Amory .45. How can I find out if it is safe for me to practice like that? It is almost surely safe. There is some debate over the potential for damaging the firing pin with extensive and repeated dry fire but most people feel that there is no real concern. Leave a Reply to Marcel Courtemanche Click here to cancel reply.